Whenever you're wondering "where are they now" in regards to former NHL players, chances are they're playing in the KHL. The KHL is widely considered to be the second-best professional hockey league in the world and part of the reason why is because there's so much former NHL talent playing in that league. 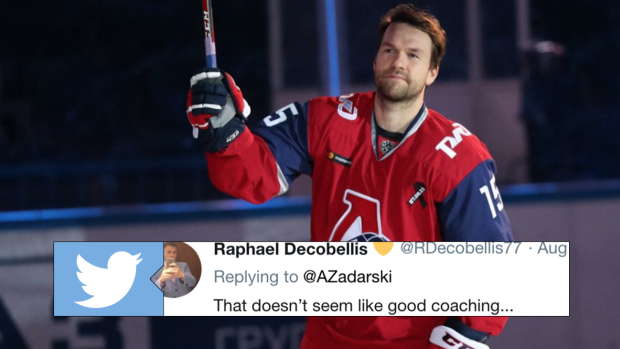 Former Hab, Oiler, and Ranger David Desharnais is now one of those players playing in the KHL, but he was forced to find a new team before playing a single regular season game for a very odd reason. According to the article the head coach wasn't made aware that Desharnais was a centre, and just played him on wing where he thought he would fit. The team's managers, upon seeing that Desharnais didn't play well on wing, decided to release him. Basically Lokomotiv didn't know Desharnais plays down the middle, not on the wing, so it's no surprise he looked out of place on the wing. Desharnais can take comfort in the fact that his new coach definietly knows where he played in the NHL as he'll now be playing for Bob Hartley. Max Talbot and David Desharnais have signed with Avangard Omsk joining head coach Bob Hartley. The KHL season gets underway on September 1st.